The unmanned Russian Phobos-Grunt spacecraft suffered a crippling malfunction shortly after launch, which stranded it in low-Earth orbit instead of sending it on toward Mars. After being marooned in orbit for more than two months, the dead spacecraft plunged through Earth's atmosphere Sunday, showering debris over the Pacific Ocean. Now, Russian officials are looking into whether strong emissions from a U.S. radar station may have been the culprit, according to a Russian news agency Ria Novosti report. A government commission has been set up to investigate the cause of Phobos-Grunt's malfunction, and investigators are planning an experiment to see how radiation affects a model of the spacecraft. The Kommersant, a daily Russian newspaper, also cited an unnamed Russian space official who claimed that Phobos-Grunt may have malfunctioned due to "external impact," according to Ria Novosti. The source did note that any kind of intereference was likely an accident rather than an act of sabotage. "Experts do not dismiss the possibility that the probe could have accidentally come under the impact of emissions [from a U.S. radar stationed on the Marshall Islands], whose megawatt impulse triggered the malfunctioning of on-board electronics," the source told the Russian paper. But, this explanation is not as believable to some Russian scientists, who called the theory "exotic," reported Ria Novosti. "Consider the power of the impact," Alexander Zakharov, a scientist at the Russian Academy of Science Space Research Institute, told Ria Novosti. "I don't think the Americans have radars capable of ensuring such power at such an altitude [about 200 kilometers]." Phobos-Grunt's science research program was developed at the Russian Academy of Science Space Research Institute, as well as the equipment that was onboard the probe. Zakharov said the radar interference theory is likely masking human errors, and he called the idea "far-fetched." "I simply think that is disingenuous," Zakharov told the Russian news agency. "It is convenient to find the cause of the failure on the outside." "The spacecraft itself should be examined first," he added. "There are problems there." An artist's concept of the Phobos-Grunt spacecraft nearing the Martian moon Phobos, something the failed probe never got to do. The $165 million Phobos-Grunt spacecraft launched Nov. 8 on a mission to collect soil samples from the Mars moon Phobos ("Grunt" is Russian for "soil"). The probe was expected to return these samples to Earth in 2014. A suspected issue with the spacecraft's engines prevented it from leaving Earth orbit, and the doomed probe languished in orbit for more than two months before succumbing to gravity and plummeting to Earth. 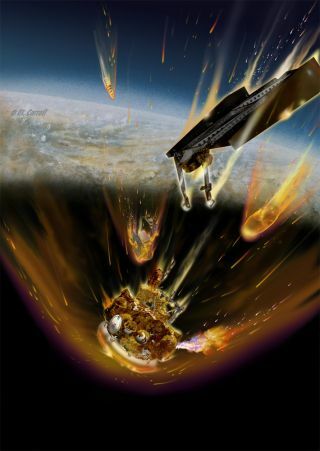 The fall of Phobos-Grunt is one of a string of space failures in 2011 that has plagued Russia's space industry. Russia's Deputy Prime Minister, Dmitry Rogozin, pointed to poor funding and relics of the industry's transition for the recent mishaps, reported the Agence-France Press.